How to Help Your Child Fall Asleep! 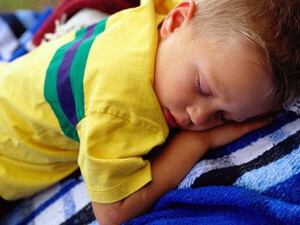 One in four children experiences sleep problems of one type or another during the course of childhood. Helping your child to fall asleep -- to conquer her insomnia -- is important to both of you. Neither of you needs the stress and frustration associated with childhood insomnia. In truth, you typically aren't dealing with a classic sleep disorder in getting your child to sleep. Instead, you're dealing with the problem of teaching her how to fall asleep on her own and at the appropriate time. One of more of the following techniques may be just what you need to enable both of you (or all of your family, for that matter) to have a calm, restful night. Calm Is The Word to Remember. Part of the process of transitioning from fully awake to fully asleep is the deliberate (on your part) calming and quieting that must proceed sleep. Before bedtime, you should intentionally slow her down from the fast pace of the day. It will help if you can bring the entire household to a slower, more relaxed pace. Calming music, the TV turned off, and a generally slower pace will help her relax so that her body is preparing itself for sleep. You will also benefit if you can establish and consistently follow a routine that invariably ends in bedtime. That routine might be 15 minutes of reading to her from a favorite (not a new) book; or sitting with her and talking about the successes of the day, reinforcing the good things she's done and how quickly she's learning to accomplish new tasks; or a session of light massage to help her relax. The key thought here is to strive for consistency -- this activity should take place every evening, always at the same time, always for about the same amount of time, and always ending in bedtime with no delays and no excuses. Your child doesn't want to fall asleep alone -- she wants you to stay in the room or stay in bed with her until she falls asleep. This might be the result of insecurity, which may be overcome by ensuring that she has a favorite blanket or toy with her. If she's afraid of the dark, a night light can provide her with some assurance. Leaving the door open a little bit may reassure her that she is not alone in the house, abandoned to all the monsters and fears of childhood. And you can reassure her that you'll be looking in on her to make sure she's OK and sound asleep. If she's awake when you check, encourage her by praising her for staying in bed and relaxing, waiting for sleep to overtake her. Consistency being the keyword here, you must insist that she remain in bed, not get up and wander around, go to the bathroom, interrupt you for a drink of water or other services, etc. Alternatively, if your child doesn't want to sleep alone, it may be because she got accustomed to falling asleep in your arms while being nursed -- you need to transition her to going to sleep alone. This may be accomplished more quickly if you begin doing it during the day. Wait until you notice she's drowsy and close to nap time. Then put her into her bed alone, reassure her that you'll be in the next room, and let her fall asleep alone. Let her mind associate bed with sleep, even when she's in bed alone -- and even if she's in bed alone because she's woken in the middle of the night. Your child wants to stay awake longer, so she doesn't miss any of the activity going on in the home. See the earlier note about calming the entire house down prior to bedtime. If there's "nothing happening," then there isn't much temptation to stay up and watch it not happen. Your child wakes up in the night and calls for attention. First, delay your response for a minute or two -- and for increasingly longer periods if the problem persists. The idea is to create a deliberate delay so that she won't expect immediate response; and to increase that delay so that she will learn that if she wakes at night the only thing to do is to lay back down and go back to sleep. If she is consistently waking during the night, she may be taking too many naps during the day; or she may be sleeping too late in the morning, so that she isn't sufficiently tired at night. When you go to her after she wakes up, give her loving attention, but not too much of it. Tuck her back into her covers, remind her that it's well past bedtime and that she needs to be asleep, give her a kiss on the forehead, and leave the room. Waking in the night should not become an excuse to stay awake. Rather, it should be an occasion for brief reassurances and then a swift return to sleep. Not all children need the same amount of sleep. If you're putting her to bed at 7:30 and she consistently falls asleep at 8:30, this might be because you're trying to give her more hours of sleep than her body actually needs. Maybe she only needs nine hours of sleep instead of the ten hours you've been told is "correct for a child her age." Rather than associating bedtime with frustration and sleeplessness, try putting her to bed at the time her body is ready for sleep. She'll get just as much sleep, but won't be frustrated and fussy at bedtime. If this proves to be an insufficient amount of sleep, you can work at returning to the previous bedtime in small increments. That is, if putting her to bed at 8:30 leaves her groggy in the morning, begin putting her to bed at 8:25 for several days, then at 8:20 for several days, then slowly move her to a bedtime that will allow her sufficient sleep while preventing the situation where she lies awake too long once she's gone to bed. Summing It Up. Work at having a calm, soothing, and consistent -- especially consistent -- routine for bedtime and for dealing with the occasional nighttime wakefulness. In the absence of illness, calmness and consistency are the best means of dealing with childhood insomnia.